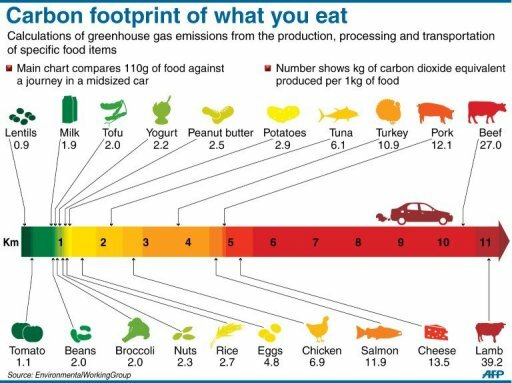 As you can see, cheese has the third highest carbon footprint. Only beef and lamb have a higher footprint. Several other sources (such as this) corroborate this. Why is it so high? You would expect it to be due to the milk production, but milk itself it one of the lowest on the chart. The chart is misleading since it compares carbon imprint by mass instead of a measure of how much a human needs to survive. The chart you link contains false comparisons. They are comparing mass of foods against each other. However, you don't eat for mass, you eat for calories (or protein or nutriment, or whatever). A better comparison would be to multiply each 1 kg of food by the calories in that food. I used the cooked option of each food when available. For the numbers with some options, I used whole milk, pinto beans, plain lowfat yogurt, almonds for the nuts, and part-skim mozarella cheese. My first conclusion, is that Cheese doesn't have such a high footprint after all. It is just a little higher than Yogurt, which is just a little higher than Milk, which is about even with eggs. All the animal products dominate the top of the list. My other conclusions are that this is kind of a garbage comparison anyways. Broccoli doesn't provide calories, but it has more vitamin K than everything else on the chart combined. The peanut butter and nuts are really calorie efficient, but so what? If you try to live on peanut butter instead of rice you'll die of heart disease because you are getting 70% of your calories from fat and three times the recommended saturated fat dosage. 1kg of cheese takes around 10kg of milk to produce (more for some cheeses - e.g. parmesan is around 1:16; less for softer cheeses). So the carbon footprint of cheese is going to be at least that factor higher than that for milk (there will be a little extra from any heat/energy input into the cheesemaking process but this will be small). Cow-milk cheese have a high carbon footprint because rasing cows have several negative effects on climate changing factors. On the other hand good cheese should not be eaten in large quantities: always eat your cheese on a piece of bread! And consider eating goat cheese: raising goats is known to have smaller greenhouse effect.